Lou Nolan has one of the best seats in the house for Flyers games: rinkside, center ice, and he doesn’t pay for it. In fact, the Flyers pay Nolan. Does Ed Snider know about this? Relax; Nolan has Snider’s full approval for his premium vantage point. Nolan is the Flyers’ longtime public-address announcer. He’s been on the job for 35 years, through Stanley Cup conquests, the renowned Flyers-Russia game and Broad Street Bullies brawls. Over the decades, Nolan has overheard countless classic comments. Nolan took in every word of Dan Carcillo’s recent tirade against the on-ice game officials and Buffalo’s Craig Rivet following his second fight with Rivet. Carcillo was angry that the linesmen let Rivet pull his hair at the end of their fight. The 1976 Flyers-Central Red Army game is one of Nolan’s career highlights. For Flyers fans who weren’t around then, this was the final game of a series pairing NHL teams vs. the Russians. Since the Russians had beaten the New York Rangers and Boston and tied Montreal, it was up to the Flyers to win and uphold the NHL’s reputation. Canada, the United States and the world were watching. Other career highlights for Nolan include serving as the PA announcer for the 1976 NCAA Final Four event at the Spectrum (“first basketball games I ever worked”, he said.) and being the rink announcer for men’s hockey at the 2002 Winter Olympics in Salt Lake City. Nolan is a traditional PA announcer in the style of the late, great John McAdams, longtime voice of the Palestra and countless other Philadelphia area sporting venues. Nolan doesn’t scream his announcements or offer catch phrases aimed at attracting attention to the announcer. Before he was hired as the Flyers public-address announcer at the Spectrum for the 1972-73 season, Nolan had never done PA work. 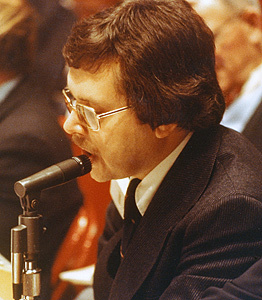 Through his friendship with Joe Kadlec, the Flyers original public relations director, Nolan worked in the press box handling statistics and other chores. Occasionally he would announce the goals and penalties in the press box. 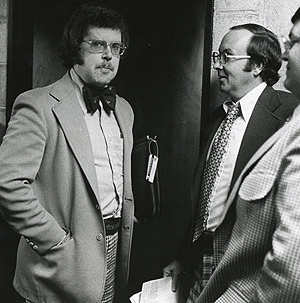 When Kevin Johnson, the Flyers PA announcer in the early years, left, Nolan auditioned for the job and was hired by Lou Scheinfeld, then a Flyers vice president. Nolan’s introduction to hockey began in the late 1950s, before the Flyers arrived in Philadelphia. A classmate of Nolan’s at St. Barnabas School in southwest Philadelphia had an uncle, George Lennon, who was a goal judge for the Ramblers, the minor league team that played at the Arena, at 46th and Market streets. Lennon became the original timekeeper for Flyers home games. When Kadlec was named the Flyers PR director, a job he held for decades, Nolan asked him to keep him in mind if he needed help. Nolan started in the press box and worked his way down to rinkside as PA announcer. During Nolan’s first game as an announcer, he was showered with ice when a player in the penalty box picked up a bucket of ice and tossed it at a rival player. With no glass protecting him at the Spectrum, Nolan was hit by pucks and sticks a few times. “The teams weren’t on the ice for the awards,” Nolan said. “I’m in contact with the ArenaVision producer and I hear `Oh, no, hear come the teams.’ I’m in the middle of the ice. I wasn’t smart enough to walk along the boards. Nolan has worked for PSFS bank for more than 20 years. He’s now a vice president for Shay Financial Services, selling securities to banks. He and his wife Ellen have two sons, Matt, 25, and Jeff, 22. Naturally, they are hockey fans. Lou Nolan’s hockey journey hasn’t taken him far in distance, from southwest Philly to South Philly. But over the years his voice has become a comfortable and reliable Philly sports staple.